Loving these Custom Sports Fan Headbands for $5.99 (Retail $12). Sports fans! Here's another opportunity for you to customize some darling bling to add to your wardrobe. Show your team spirit with our customized super soft knit headbands (poly blend). 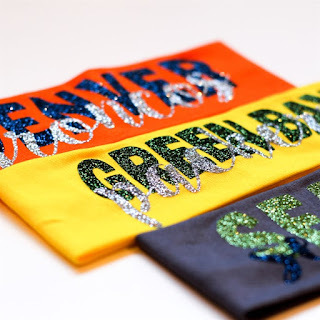 Choose your professional, college or high school team, colors and leggings to create your one of a kind fan favorite fashion necessity. These headbands fit both kids and women. Glitter is made with commercial adhesive and does not crack or flake with normal use. Overstretching may cause some small cracking.